Valve finally revealed its Steam Controller for its Steam Box late last month, and now it has come out with a four and a half minute video showing it in action. Though it's only the prototype controller being shown in the video posted below – which is being shipped out to 300 beta testers, it's still an odd looking controller with its two trackpads and touchscreen. The video shows that the controller works much like a mouse and keyboard, with games within the demo even recognising the controller as such. The demo video only gives us a glimpse of how it will function, using games like Counter Strike and Civilisation V.
We won't truly know whether it'll live up to the accuracy of a mouse and keyboard until we get our hands on it - though this may happen as early as January at the Steam developers' conference. Over the last couple of weeks the company also took the wraps off of the Linux-based SteamOS and beta Steam Machine as well. 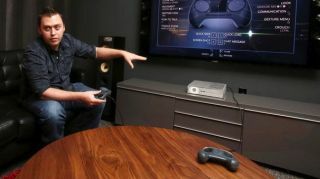 While we don't know what the final Steam Box product will actually look like, the Steam Machine with the prototype Steam Controller is due to be shipped for beta testing before the year is out. Beta testers will be working with a variety of specs, with some Steam Machines to be powered by an Nvidia Titan GPU and an Intel i7-4770 CPU amongst other GPU/CPU options, while all Machines will come packing 3GB of DDR5 RAM, a 1TB/8GB hybrid SSHD and an internal 450w 80Plus Gold for power. Here's all the latest news and updates on the Steam Box.